Or scroll down to learn more about borrowing with us. Are you a Broker? Click here. Need help? Call a loan officer at 1-888-959-1465 or e-mail us. We Are Proud to be Your Nationwide Alternative Real Estate Lender. At Patch of Land, we know that Real Estate means REvitalizing and REnewing America’s neighborhoods, and that means real change. When new technology meets new lending philosophies, it creates new funding possibilities. Our platform provides transparency, low minimums, ease of transactions and project-by-project investment to bring real change, and real profit, to real neighborhoods like yours—and real people like you. Don't Miss Another Opportunity. Get Prefunded and Close Quickly. As real estate markets continue to heat up, Patch of Land can help you take advantage of opportunities to invest in single family residential and commercial properties in as little as 7 days. Whether you’re rehabbing houses, duplexes or apartment buildings in an already flourishing neighborhood, looking to finance a stabilized rental property, or doing pioneering redevelopment in an up-and-coming area, you need funding fast in order to capitalize on both your insight and your opportunities. 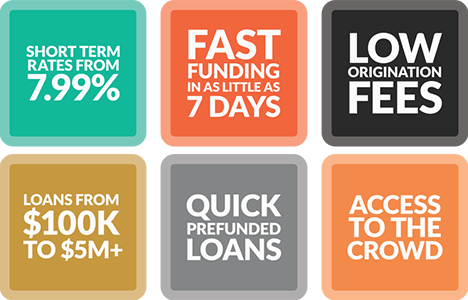 With short term rates starting as low as 7.99%, you can get funded in as little as 7 days. Submit a quick application online to let us know about you, your project, and your funding needs. We prefund so you can close quickly and start your project fast. Then watch your loan get funded online by our pool of committed, interested investors. Get to work and follow your vision! Keep us posted with regular updates about your progress to share with investors who believe in you—and your project. Are you ready to get your project funded fast?